When pursuing a lawsuit against a negligent party it can be a challenge proving your case successfully. Whether he or she is an expert relating to an issue of liability, such as whether a particular doctor fell below the standard of care expected when performing a medical procedure, or an issue relating to damages, such as an orthopedic surgeon opining on the prognosis of your fractured ankle, expert witnesses can be valuable assets in advancing your claim and getting the compensation you deserve. There are various benefits to lawyers obtaining the opinions of expert witnesses. First, they can provide important technical details that may not otherwise be present in your case. As an example, there could be some well-known medical literature in his or her field that is unknown to the layperson but which helps prove his or her opinion regarding your injuries. There may also be a regulation or set of standards that he or she is aware of that can help show how someone is at fault for your trip or slip and fall accident. Second, expert witnesses also tend to have a lot of experience in matters similar to yours. Whether it’s an expert engineer examining the functioning of an elevator or a psychologist who has decades of experience dealing with individuals with post-traumatic stress disorder, it can be much harder for the opposing lawyer to deny or refute the expert’s claims. 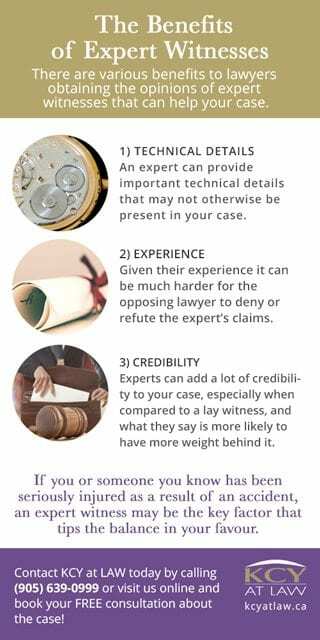 Third, experts can add a lot of credibility to your case. 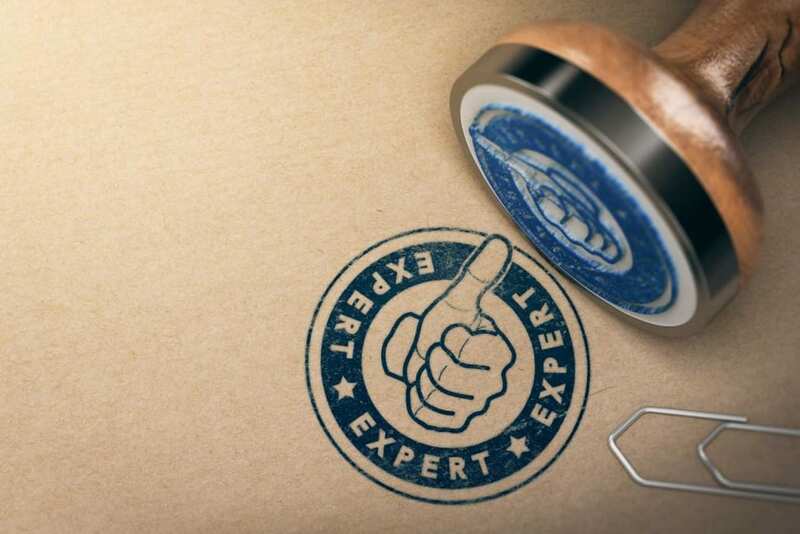 As opposed to a lay witness (for example, a friend, family member, or independent witness to an accident), an expert is most often well-versed in the particular area that they have been retained to opine on. As such, a lot of what is stated by an expert, whether in a report or on the witness stand, is more likely to have more weight behind it. If you or someone you know has been seriously injured as a result of an accident, an expert witness may be the key factor that tips the balance in your favour. 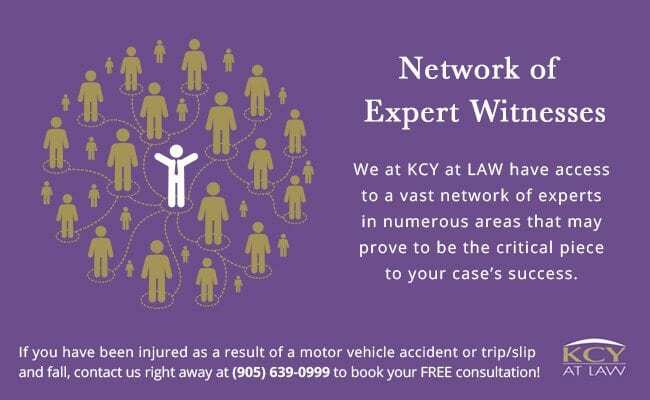 We at KCY at LAW have access to a vast network of experts in numerous areas that may prove to be the critical piece to your case’s success. If you have been injured as a result of a motor vehicle accident or trip/slip and fall, contact us right away by calling (905) 639-0999 or contact us online to book your FREE consultation!